Forty-five Baltimore CVS workers who saw their stores burned down in the riots earlier this week are still getting paid. Two CVS locations sustained such heavy damage that they remain closed Thursday. But "given the extraordinary circumstances," CVS is paying those workers for their regularly scheduled hours while they try to transfer them to nearby stores, spokeswoman Carolyn Castel said. In fact, "most" have already been working at other locations, she said. There are 20 other CVS stores in the city. Castel declined to say how long they would keep paying the displaced workers, but added she is "confident" that the company could place all those who want to work at another location. 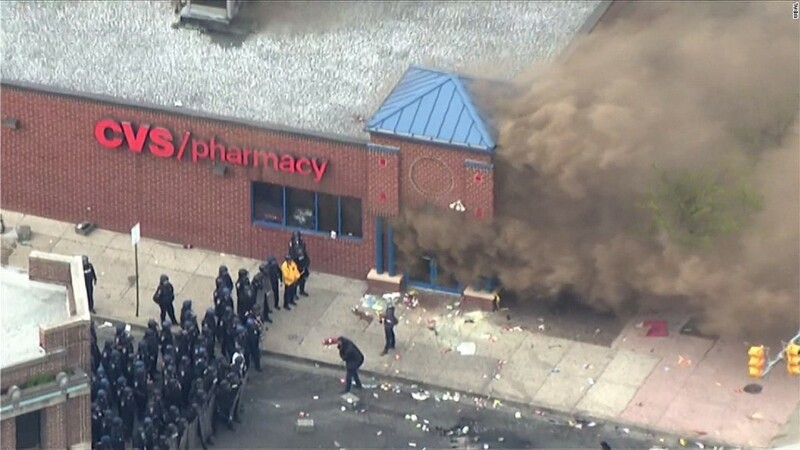 The two CVS stores were damaged on Monday night in riots sparked by the recent death of Freddie Gray. The 25-year-old died in police custody under circumstances that remain unclear, raising long-simmering tensions between police and residents. Mayor Stephanie Rawlings-Blake has said that the community fought hard to get CVS to invest in these neighborhoods. Both CVS (CVS) stores were opened in the mid-1990s and are among the few options residents have for pharmacies and groceries, Castel said. The scene in Baltimore has calmed since Monday night, but protests -- mostly peaceful -- continue. A 10 p.m. citywide curfew is in effect for the rest of the week. "CVS Health remains fully committed to serving our customers and patients in Baltimore -- and we have been grateful for their show of support over this week," Castel said. Customers of the shuttered stores who need to pick up a prescription can get their medicine at a nearby location.